An exhibition curated by Matthew Gale, Marko Daniel and Kerryn Greenberg, in collaboration with Teresa Montaner from the Fundació Joan Miró in Barcelona. 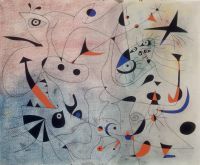 The works of Joan Miró will be shown in London in the most comprehensive retrospective exhibition undertaken in the last fifty years. Acclaimed as one of the great Surrealist painters, Miró worked in a wide range of styles. The exhibition is a unique opportunity to enjoy more than 150 of his paintings, drawings, sculptures and engravings created throughout his extraordinary artistic career spanning six decades. The exhibition examines Joan Miró's commitment to his time and to Catalonia, through three stages of his creative output.